Write About This intrigued me as soon as I read about it. 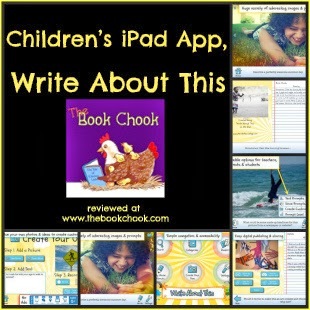 I love to find and share any tools that encourage children to write, so I was excited to discover Write About This not only prompted kids to write, but also to create their own prompts. Double delight! 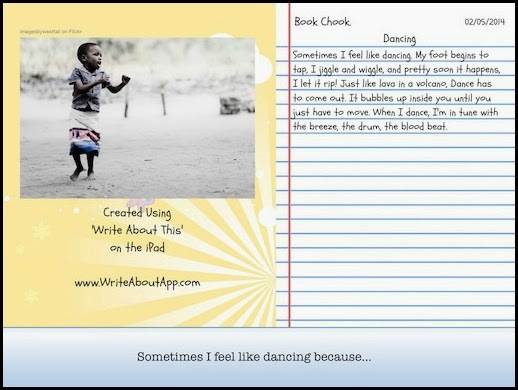 Write About This is a visual writing prompt and creation platform perfect for classrooms and families! With endless ways to respond and the ability to craft custom photo prompts, it will kick-start any writing activity. 125 categorized images and 375 text+voice prompts included! Multiple authors can write and save to the gallery. Save to the Camera Roll and share a polished .pdf by email! Voice and Level options based on learning theory and real classroom experience! There’s a free version of the app that gives you a taste of the full version so you can try before you buy. One of its creators is teacher, Brad Wilson, who saw a need in the app market for picture-related prompts for primary (elementary) school kids. I love its versatility and that it celebrates kids not only as writers but as prompt creators themselves. Having children create prompts for each other introduces a collaborative and game-like element that I applaud. Let’s have fun with writing! Navigation and layout is simple and obvious. The built in prompts consist of pictures and some text to further tease out ideas. I like the thoughtful range of prompts - some that require kids to look inside themselves for a response, some that provoke fun and mirth, others more serious that would make excellent topics for children’s speeches or essays. The prompts are also categorized. There’s a notice under Parent/Teacher information that explains there is zero data collected from within the app. Kids can save their work to the camera roll, and best of all, they can create prompts from their own saved pictures, or snap pics intentionally. You can see the format of a created prompt in my sample below. You can check out the iPad apps I reviewed in 2013. Or browse my Pinterest board of Book Chook reviews.